“In a fluent and readable style of writing, this doctor critically exposes the link between our genetically determined aging process and our diet. This is highly recommended for anyone who consciously wants to eat more healthily." "[This] dietary approach does seem very consistent with what we see to be consistent with scientific evidence." Already more than 350 000 copies sold! 'The food hourglass' is or will be available in English (HarperCollins), German (Random House), Spanish (Random House), Italian (La Feltrinelli), Dutch, Croatisch, Polish, Chinese, Danish and Russian. ﻿This scientific article﻿ (pdf) describes some ideas behind 'The food hourglass' . This article was written by the author of 'The food hourglass'. 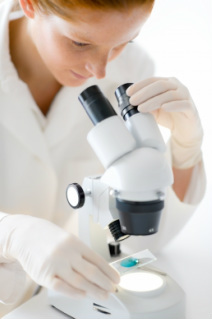 In this article, he also introduces a new science field called 'nutrigerontology'. This is a note for medical doctors and dieticians. This new cover depicts an hourglass filled with food (see below). The content is exactly the same as in the book with the previous cover. Why most diets are unhealthy. 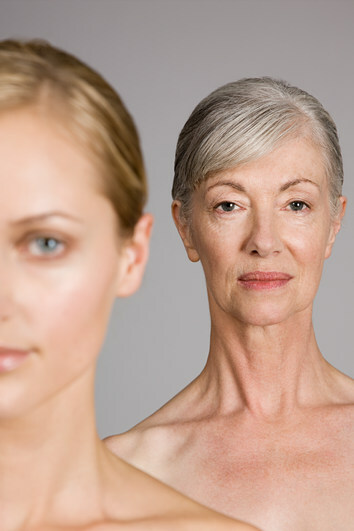 Why most antioxidants don't slow down the aging process. Why white tea reduces the appearance of wrinkles and at the same time is healthy for your blood vessels. Why studies show that people who eat walnuts daily have less risk of a heart attack, and why blueberries and dark chocolate protect against Alzheimer's. Why 80% of heart attacks and 90% of diabetes is preventable. Why many fats are nonetheless good for your heart. This book is written by a medical doctor who looks at the consequences of our food habits and diets in the long term. The food hourglass contains more than 280 scientific references and debunks many myths surrounding health and the aging process. The food hourglass was first published by Prometheus-Bert Bakker, one of the most reputable publishers in The Netherlands which, among others, published books of Stephen Hawking, Tom Wolfe and Zadie Smith. _What makes 'The food hourglass' different? 1. 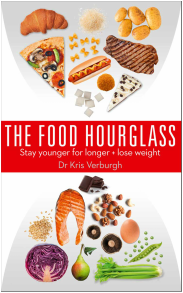 The food hourglass is the first book that describes how certain foods influence the aging process. The weight loss that naturally follows is a pleasant side effect. 2. The food hourglass is the first book which looks at the influence of diets in the long term. From this, it appears that most diets are unhealthy. 3. The book is written by a physician and researcher who has been fascinated by the aging process for many years. Dr Verburgh wrote three science books by the age of 25. He published his first science book at 17 years old. His books have received several awards, nominations and reprints. 3. 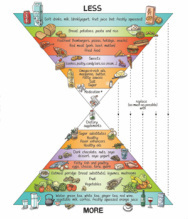 The food hourglass is also an illustration in the shape of an hourglass which shows at a single glance what healthy, and more specifically, unhealthy foods are. This makes the food hourglass a tool to make more healthy food choices. 4. 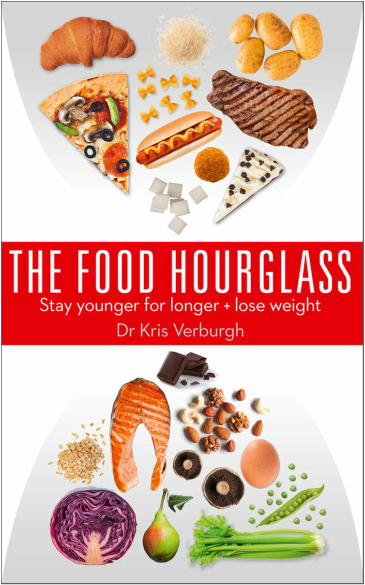 The food hourglass is based on the latest insights into biogerontology (the science of aging). the only scientifically proven method that slows ageing significantly is not a drug or a ‘super-antioxidant pill’ but a certain diet. _"As enthusiastically written as it is clear." "A wonderful book, that even I can understand." "One of the best books around at the Book Fair!" "This books reads remarkably well." "Very enjoyable to read and very informative."